You may be holding on to unwanted and broken jewelry for sentimental reasons but you could be sitting on serious money. Jewelry containing gold, silver and platinum is always valuable even when broken. 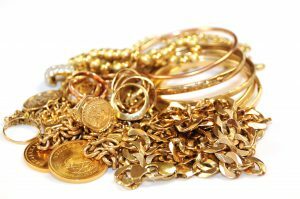 Scrap metal dealers can readily get the precious metal from the scrap so they are very willing to buy your unwanted broken jewelry. Many dealers will not accept jewelry plated with precious metals as the content of the precious metal is very little. Your jewelry will be purchased for the precious metal alone discounting the other alloy metal and any stones. The content of precious metal in jewelry items can be seen on stamps on the items. Each precious metal has its denotations to show the content in the jewelry. Selling scrap gold and silver jewelry is easy and straightforward. Many dealers know how to determine the content of precious metal in the item. Your item will be weighed and the content calculated according to the purity stamp. An 18K gold chain weighing 20 grams for example would have 15 grams of pure gold. The dealer will pay for this according to the spot price of the day. The spot price will typically be quoted as $/troy ounce. A troy ounce weighs 31.1 grams, so all you have to is divide the quotes price by 31.1 to get the price per gram. Spot prices for gold, silver and platinum are updated daily and easily accessible on the internet with a simple web search. Dealers will typically pay 60-80% on the spot price for broken jewelry as they will have to incur extraction costs.